I love serving shrimp at parties and this year for our Open House I wanted to spice up things, instead of having the same old boiled version with cocktail sauce (which, BTW, there is absolutely nothing wrong with that, especially if you’re a shrimp lover like me!) Since I was making a variety of appetizers, plus some sweets and homemade chili, I decided to make pickled shrimp so I could prepare it the day before and leave it in the fridge, but not worry about keeping it iced down. 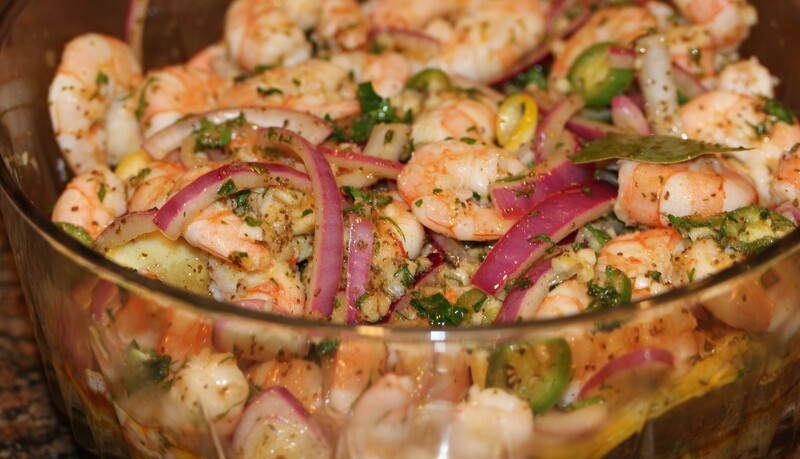 I looked online at a number of pickled shrimp recipes and combined several of them to come up with this version. It has just the right amount of spice and heat, and the lemons add a great citrusy freshness to the appetizer. It was a crowd pleaser for sure! The only thing I would do differently is to buy the shrimp already peeled and deveined — to me it is worth the extra money! 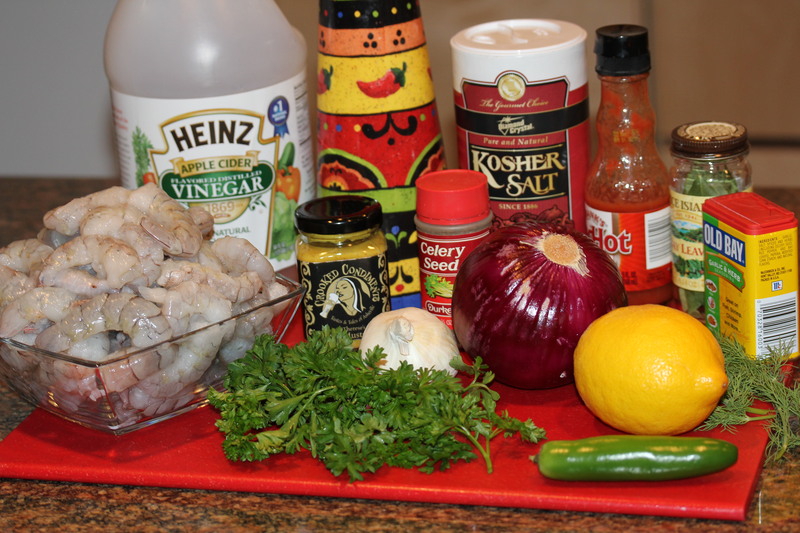 In a large bowl, mix all of the ingredients except the kosher salt and shrimp. 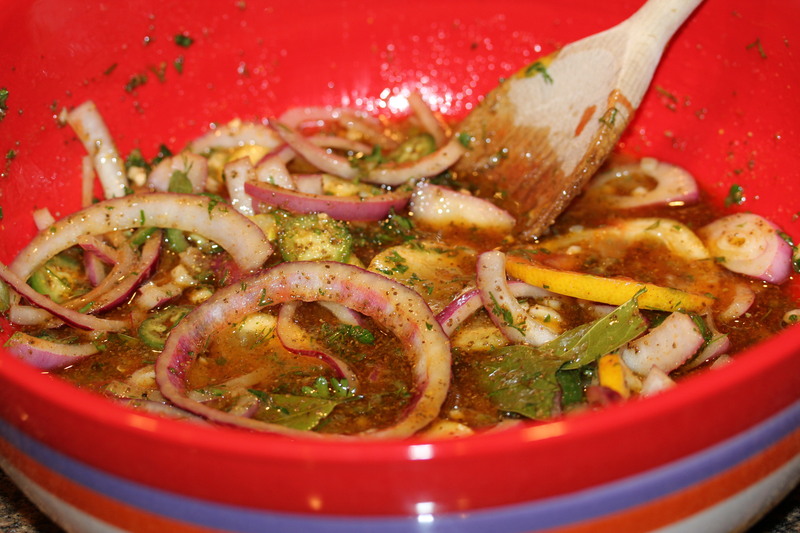 You can add some kosher salt and fresh ground pepper to this pickling mixture as desired. 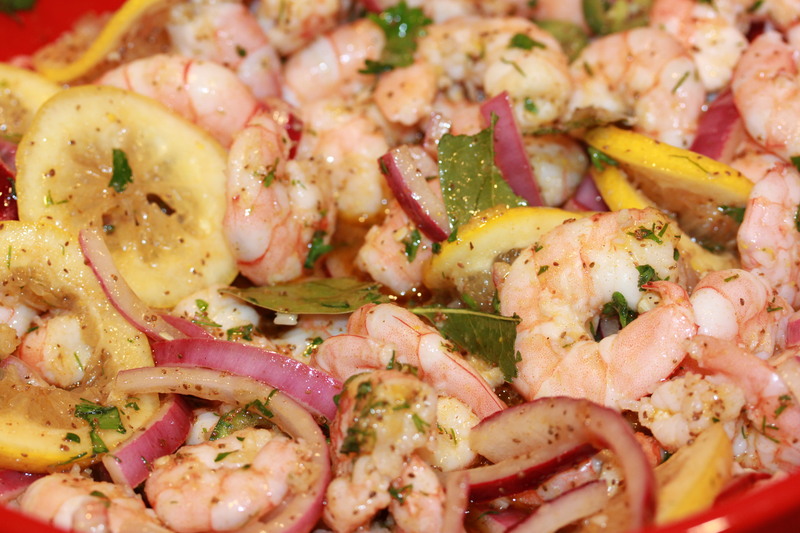 Drain the shrimp and add them to the pickling mixture, making sure you coat them well with all of the liquid, etc. Refrigerate overnight and take them out right when you are ready to serve them. This is really an easy, colorful and decidedly delicious way to make shrimp and I promise they won’t last long! 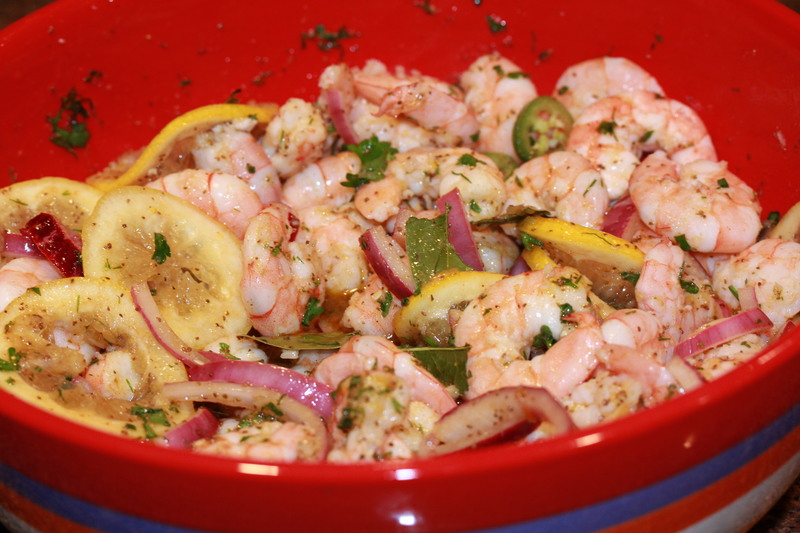 This entry was posted in Appetizers, Pescatarian, Recipes and tagged boiled shrimp recipe, eat drink and be merry, Kel's Cafe spicy pickled shrimp recipe, Kelley Chisholm recipes, pescatarian recipes, pickling liquid for shrimp, shrimp appetizers\. Bookmark the permalink. Thanks for posting! Can�t wait to try this. Also, I have an alternative way of cooking the shrimp that you might like. For this dish, you would have to season the shrimp a little differently because it doesn�t involve any liquid in cooking the shrimp. They basically steam in their own juice. 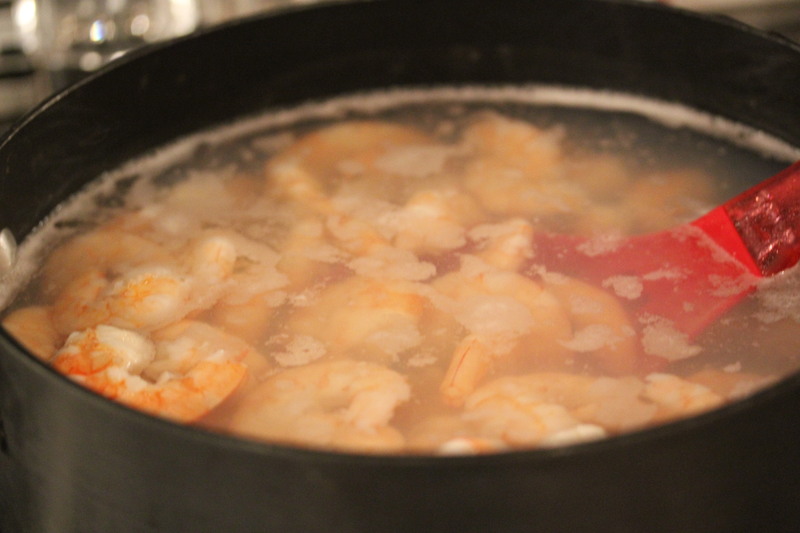 Using head-off, unpeeled shrimp, just bring a covered pot to a steaming, hissing point. 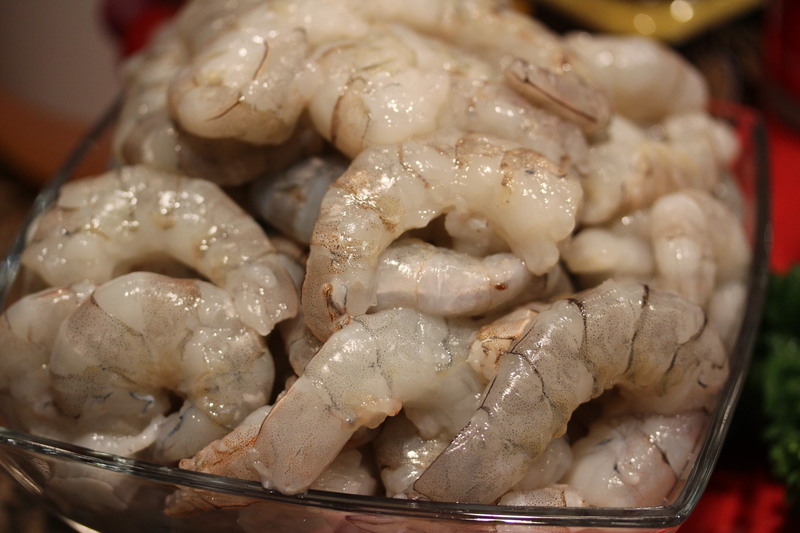 Remove from heat, stir in salt, tossing the shrimp. Replace, covered, on heat until steaming, hissing recurs. Remove from heat, leave covered for 15 minutes. No peeking. Then open and peel/use. We always use this for peel-your-own shrimp but it works great for other dishes calling for cooked shrimp. They are always perfect! Learned this from an old shrimper in Wilmington. Thanks, Jerry – I will give that a try. You always have the greatest tips. BTW, I forgot to list 1/2 cup EVOO in the ingredients in my original post, but have since corrected.